Air Plants Are THE Ideal Indoor Plant. No Dirt. No Mess. No Kidding. Several years ago I was first introduced to air plants, or Tillandsia, by my sister, Laura. She was enraptured by these unusual plants and wanted her sisters to find the same joy in them that she had found. Every couple of years my mom, sisters and I go on a weekend vacation together. One of our favorite traditions is to give a simple gift to everyone. The rules are simple: everyone gets the same thing, it costs about $5 and it’s something that we love. (It’s super fun!) Laura presented everyone with a glass teardrop terrarium for growing air plants. Sad to say, but I didn’t believe her. I thought, well that’s easy for you to say. You live on the coast, where it’s humid. I live in an arid desert. These plants will never perform for me. I was wrong. My air plants are thriving. 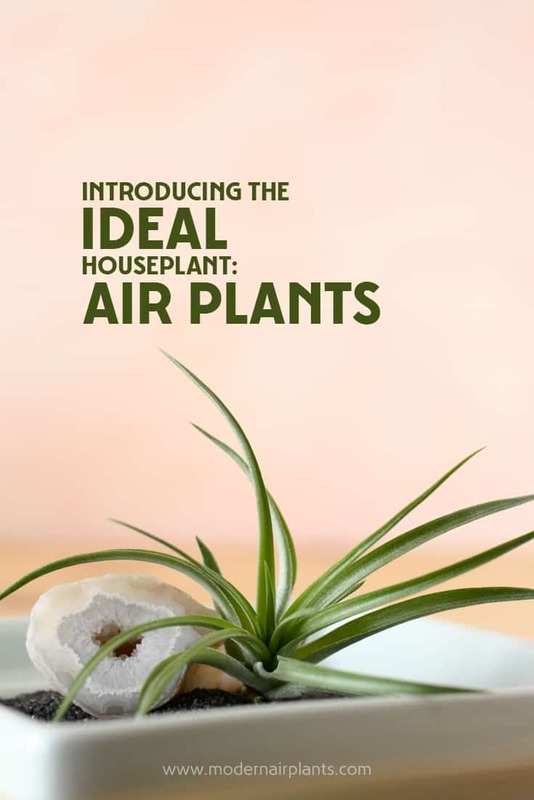 That’s why I’m convinced that everyone can grow healthy air plants, regardless of climate. 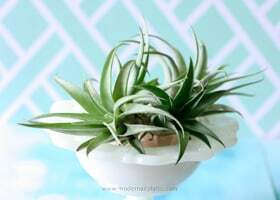 Since the air is dry where I live, I do have to water my air plants more frequently than those who live where humidity levels are higher. But, don’t be misled, like I was. Air plants are great indoor plants, no matter where you live. Above is the teardrop terrarium that my sister gifted to me, my first introduction to air plants. Thank you Laura! The terrarium looks elegant with the T. caput-medusae resting in white sand. 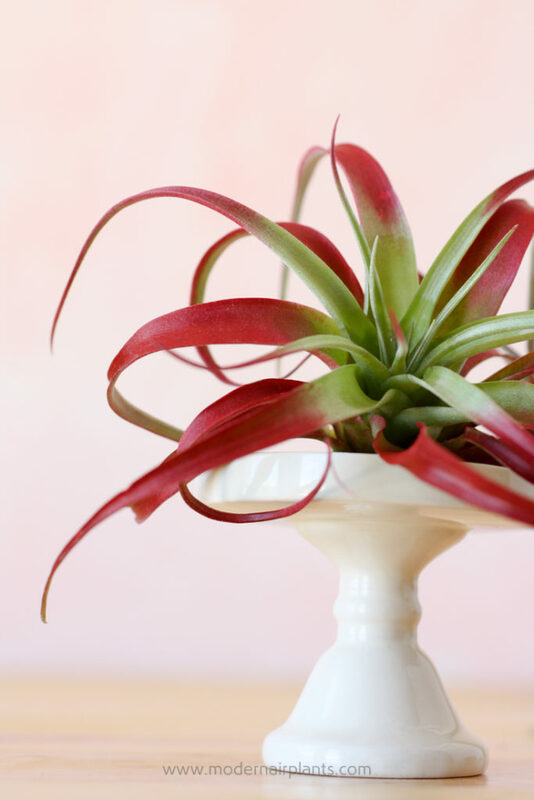 Although air plants need more than just air to survive, their requirements are simple. The primary needs of an air plant are water and light. 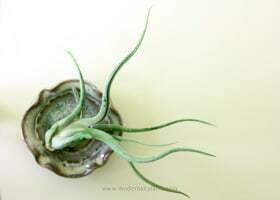 Tillandsia are unique among plants because they do not absorb moisture through their roots. Instead they absorb water through the trichomes on their leaves. These scaly or hairlike trichomes grow on both sides of the Tillandsia’s leaves. Water is absorbed both through rainfall and through moisture in the air. As a houseplant, air plants require weekly soaks in a water bath to fully hydrate their trichomes. The beautiful silvery trichomes on the Tillandsia ionantha ‘fuego’ (left) and Tillandsia ionantha (right) look almost powdery or hairlike. Trichomes are clearly visible on these Tillandsia caput-medusae. 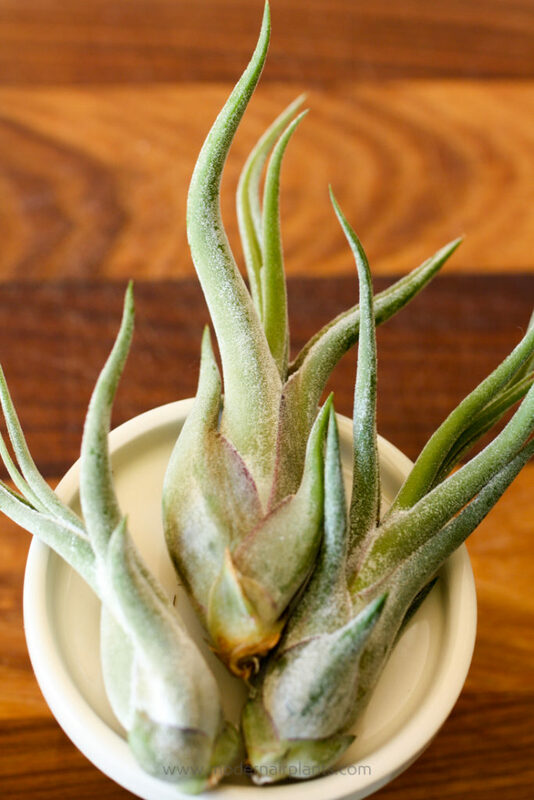 Their stiff, other-worldly leaves give the air plant it’s unique shape. A lot can be learned about an air plant by looking at their trichomes. Those that come from harsher, dryer climates have more pronounced trichomes revealing a more silvery appearance. Their leaves quite stiff. Trichomes are like built in sunblock, protecting the leaves from intense sunlight. These Tillandsia from arid climates are known as xeric. Those tillandsia that originate from more tropical climates are known as mesic tillandsia. These plants are less silvery and softer to the touch than xeric tillandsia. Their trichomes are less pronounced and may even be microscopic. The bottom line for you and me is that xeric tillandsia can handle more intense sun and are more drought tolerant, while mesic tillandsia don’t have the same high light requirements as do the xeric plants. On the other hand, mesic air plants won’t handle drought as well xeric. The slick leaves and lush appearance are the tell-tale signs that this red-tinted Tillandsia abdita is a mesic variety. 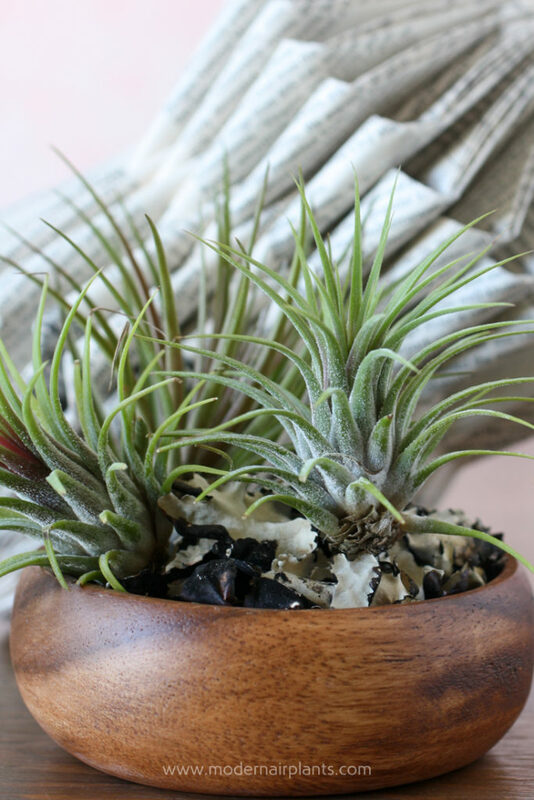 While it is useful to know which types of air plants you own, you can certainly grow both types, no matter where you live. Their are some air plants that don’t fall neatly into either category and are known as semi-mesic. Another variety are hydric Tillandsia. These plants require high amounts of humidity and grow in or near water, and do not grow well in a home environment. It is unusual to find these types of air plants available for retail. Because the Tillandsia’s trichomes absorb water through both rain and humidity, your air plants require a weekly soak in tepid water. I recommend soaking your plants for about an hour each week. The hour time frame is variable. 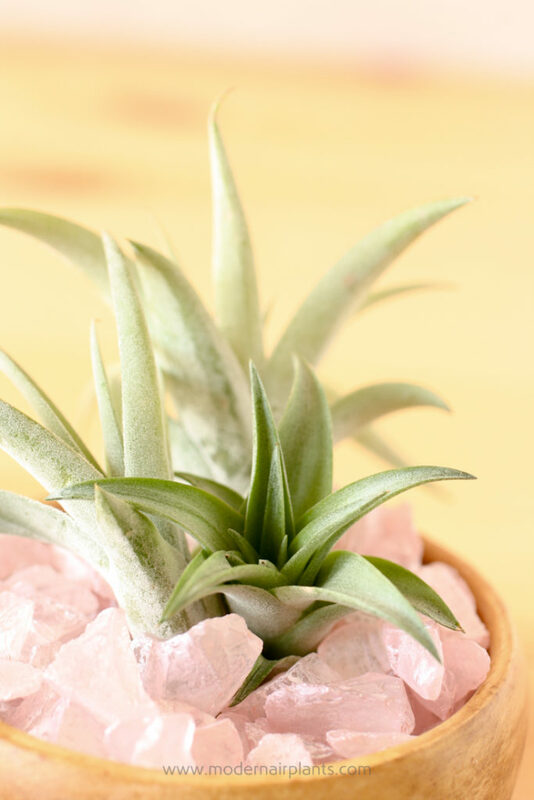 If you live in a humid climate your air plants may require less time (perhaps as little as 20 minutes), and if you live in the desert your plants may require more time (up to 4 hours). 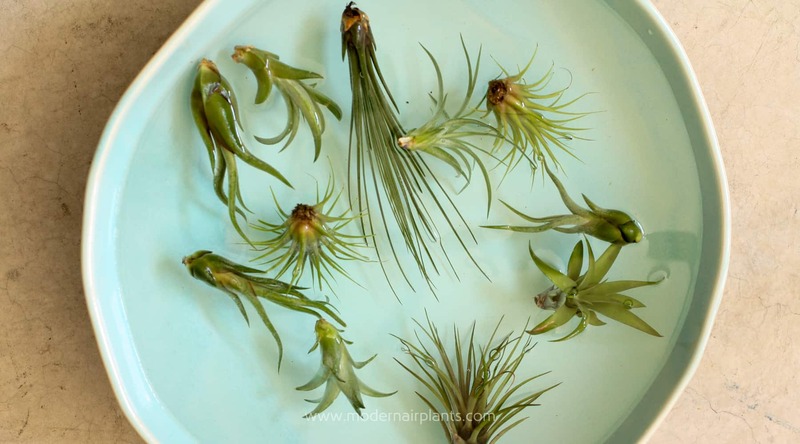 After soaking your air plants set them on their side, or up-side down for about 4 hours to allow the excess water to drain away from the plant. Then, once the plant has dried completely, return it to its display. This step will help to prevent your plant from rotting. 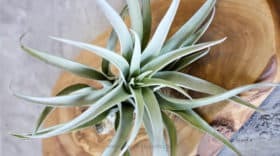 Although air plants will not survive on misting alone, a good spritzing can be beneficial. 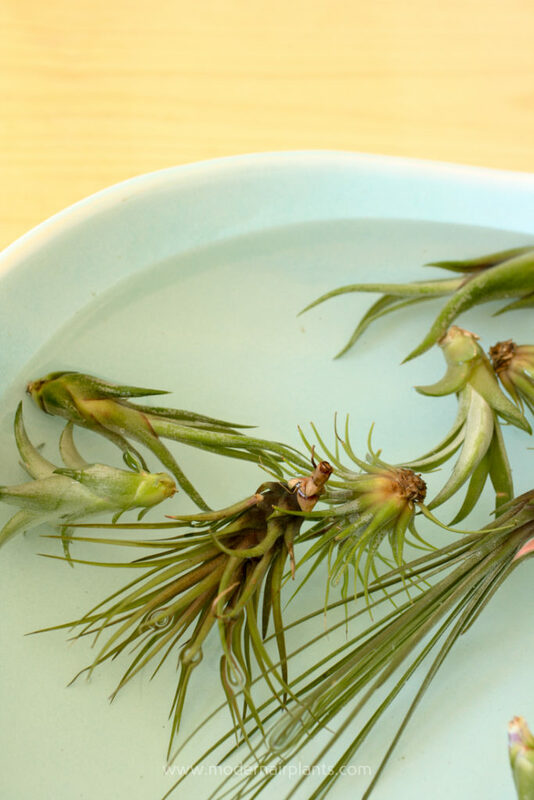 Also, if you are in a hurry, you can quickly submerge your air plant in water, dunk-style. Just remember that your air plant still needs it’s weekly soak. Like all plants, tillandsia require light to grow. A good rule of thumb is about 3 feet away from a window. This will help your plants to get enough light to photosynthesize, while escaping the intensity of direct light. East, west, and south facing windows are ideal. 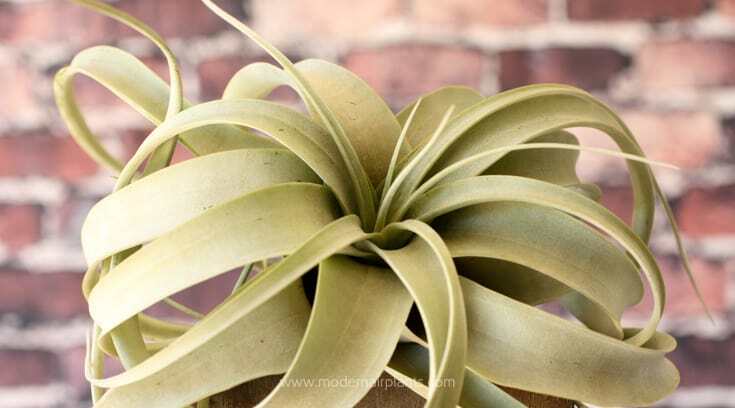 Bright, indirect light is ideal for air plants. 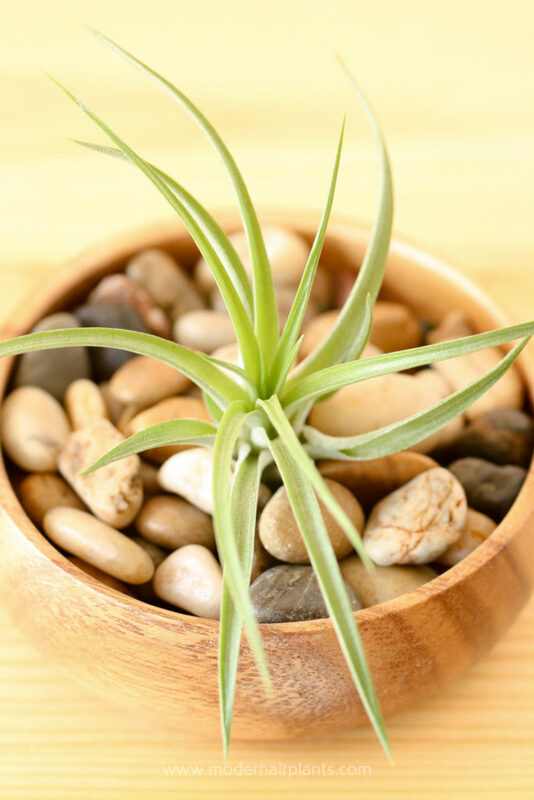 Quick tip: while air plants require air circulation, avoid placing your plants near vents for heating and air conditioning as it it too drying. Because air plants are soil-less, their display possibilities are endless. They can be displayed in ways that other soil dependent plants can only dream of. 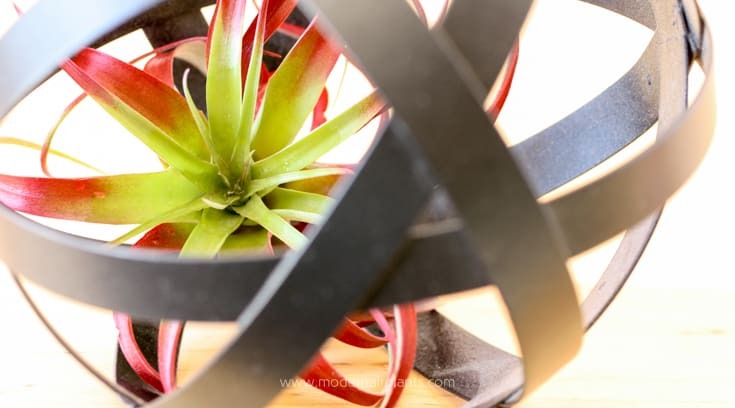 Additionally, the remarkable shape and texture of air plants lend them a sculptural quality. Here are a couple of air plant display ideas to get you started. Rocks are great substrate for displaying air plants because they are dry and allow for the air plants to be shifted around until they are securely nestled in. 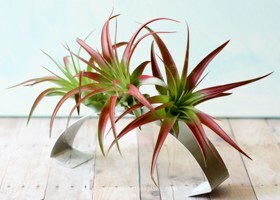 The air plants can also be easily removed for watering, and just as easily returned. 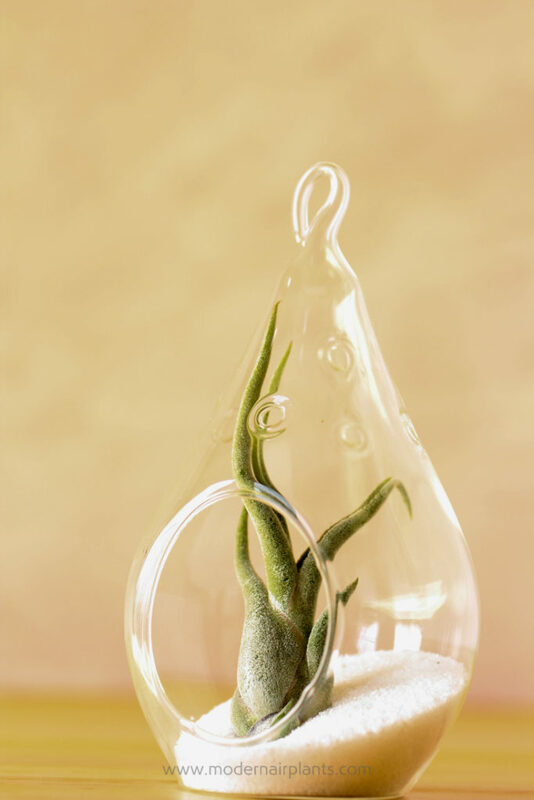 Tillandsia harrasii on pink sea glass create a quiet, calm look. For a casual, earthy appearance place a Tillandsia in a bowl of polished pebbles. 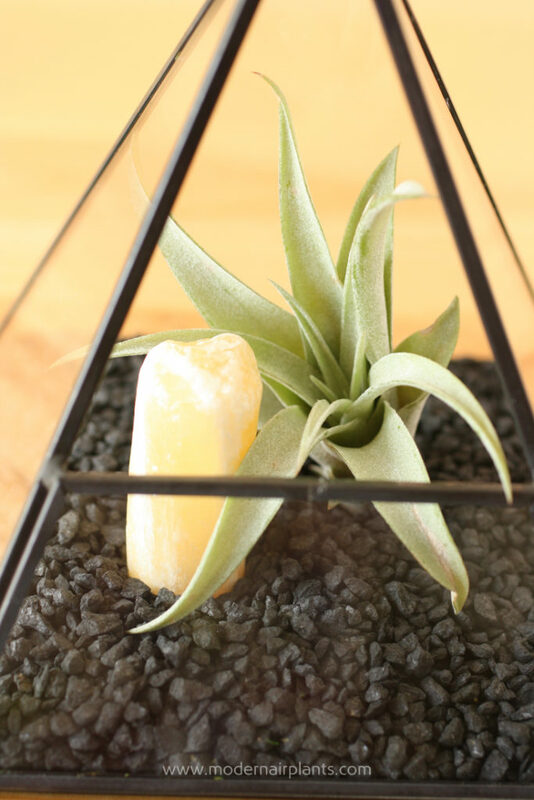 For a sleek, contemporary look pair air plants with black lava gravel inside a pyramid terrarium outlined in black metal, finished with honeycomb calcite. 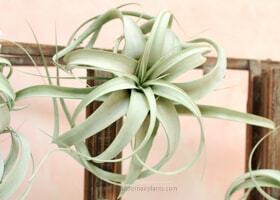 If you have access to air, water and light, you have everything you need to grow air plants. If you’re in the market for modern indoor plants, that are high in visual impact and low in care requirements, may I suggest air plants.